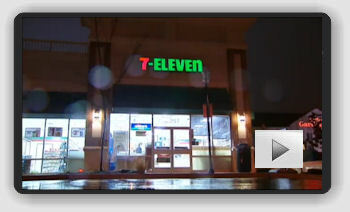 Second Maryland 7-Eleven Hit by a "Birthday Party" Flash Mob Attack of 50+ youths Saturday night. With cameras in plain view over 50 youths hit a 7- Eleven store in Silver Springs, MD, right after 11 pm and stole various snacks and drinks. Surveillance video posted on YouTube by the department shows the suspects walking up and down the aisles of the convenience store and grabbing snacks, then placing the food in their pockets. When cops arrived at the scene, the flash mob scattered, running from the store. Six stragglers were found later with items that they could not prove they paid for, according to police. Investigators believe that the large group had come from a birthday party in the area. A similar incident happened in August at another 7-Eleven in nearby Germantown, where 30 youths walked into the store late at night and plucked items off the shelves as if they were shopping. Some were even savvy enough to cover their faces with their shirts to protect their identities from cameras. No arrests were made in the incident. Officials in Montgomery County are now considering putting a teen curfew in place as well as creating legislation on loitering. The city of Philadelphia instituted a curfew this past August after a spate of violence involving teen flash mobs. Police departments in several U.S. cities have been investigating flash mob incidents for the past several months -- large groups of youths suddenly appear, as if out of thin air, to commit assaults, robberies and other crimes, according to an earlier report by FoxNews.com.